Unique in Truro, the Meeting House survives amidst its burial grounds and together they are listed in the National Register of Historic Places as the First Congregational Parish Historic District, Truro, MA. 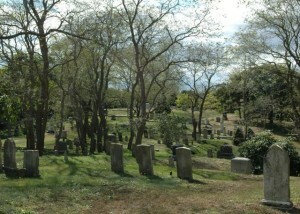 Although these two burial grounds are separately administered, one by the Parish, the other by the town, they are allied in their historic importance to Truro. The old family names like Rich, Snow and Paine appear on gravestones in both; mariners who were lost at sea are remembered in both; church members and artists are buried in the Congregational as well as the Snow. These two cemeteries cover almost six acres, and though the Congregational was laid out when the Meeting House was built in 1827 and the Snow traditionally began with the burial in 1849 of the Stevens children, evidence suggests both yards were in use earlier for burials. 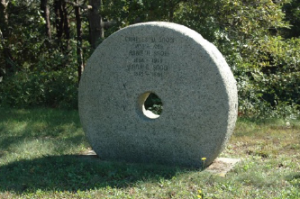 Comprising about 600 sites, the variety of monuments is impressive: from engraved deaths heads, anchors, weeping willows and insignia (the work of 19th C stone cutters Hopkins and Linnell has been identified) to wooden crosses and millstones, animal sculptures and natural rocks. The Congregational Cemetery which surrounds the Meeting House does feel like the old religious graveyard that it is. Stones nearest the building are arranged in pew like rows where original pew holders Knowles, Atkins, and Davis, among others, rest while the newer section marks the passing of more recent stewards of the Parish like Dr. Charles Davidson and Robert Bostock. Town Clerk John B. Dyer and his son selectman and civil engineer John R. Dyer Sr. have markers on the edge of the yard. 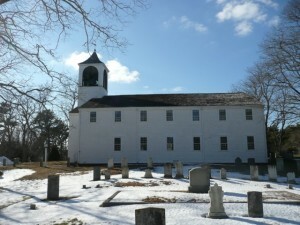 John R. oversaw the 1955 renovation of the church and together with his father and son, the lawyer and selectman John R. Jr. (Snow Cemetery), enabled an unbroken tradition of “John Dyers” to be Clerk of the Parish from 1914 to 1995. Thoreau noted the devastation to Truro caused by the 1841 widow maker gale when 57 men and boys of the town perished in 7 fishing boats. The fenced obelisk on the Congregational Cemetery’s eastern edge that marks their passing joins many graves of mariners lost at sea in both yards. Another smaller obelisk in the Hopkins family plot describes the Civil War service and death of John L.D. Hopkins in a Confederate prison camp. 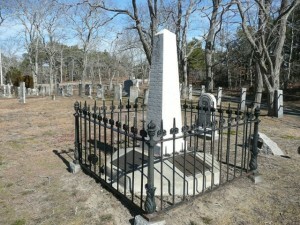 Nearby is the grave of artist and Truro Historical Society founder Courtney Allen. In order for the Parish to raise funds for the maintenance of the Meeting House, the Congregation voted this year to make the Congregational Cemetery grave sites available to people who are not members of the Congregation. Contact us for more information. 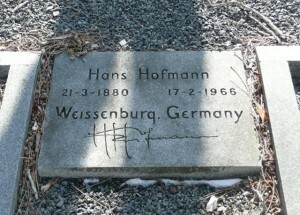 Snow Cemetery has, however, a concentration of memorials to Provincetown and Truro artists and writers. Perhaps because one can glimpse the bay from its high point, perhaps because of its more “picturesque garden design” and hilly terrain with woodland graves, it drew painters Frederick Waugh, Charles Hawthorne, William and Lucy L’Engle, and Hans Hoffman—to name a few–to choose this place for their memorial markers. Playwright Susan Glaspell, Broadway director Joe Anthony, and fiction writer Phyllis Duganne joined locals like builder C.W. Snow, Lifesaving Surfman Ephriam Dyer, and Advocate columnist Tom Kane in this tranquil spot. Guided tours during the summer season, as listed in our events calendar, enable a visitor to appreciate funerary art, find ancestors, hear anecdotes, visit a receiving tomb, read epitaphs, learn Truro’s history and connect with those like Stevens and Atkins who gave the land, like Davis who built the Meeting House. Artistic creativity inspires us both in the works of those remembered here and in the design of their monuments. Those who went before live on, and a tour or a ramble brings us to one of the most peaceful spots on earth.